Séries4 - Evangelical Lutheran Seminary of Canada and Waterloo College. Student financial records, 1931/32- 1933/34. Carroll Herman Little (1872-1958) was a Lutheran minister, and a professor at Evangelical Lutheran Seminary (now Waterloo Lutheran Seminary) and Waterloo College (now Wilfrid Laurier University) in Waterloo, Ontario. Born in Hickory, North Carolina, Little received a BA from Gaston College, a BA from Roanoke College, and graduated from Mount Airy Theological Seminary. From 1901-1911 Little served as a pastor in Nova Scotia, and as housefather of Bethany Orphans’ Home from 1911-1914. In 1917 Little became of Professor of Systematic Theology at Evangelical Lutheran Seminary, where was also served as acting President 1918-1920, 1929-1931, and 1942-1944; Bursar 1918-1933; and Dean 1920-1927. 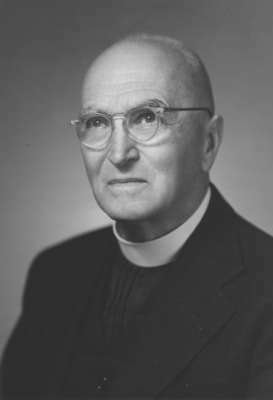 He served as secretary of the Evangelical Lutheran Synod of Canada from 1927-1944. In 1914 Little received an honorary degree of Doctor of Divinity from Lenoir Rhyne College in Hickory, North Carolina. The fonds consists of personal and professional correspondence of C. H. Little. Fonds is comprised of the following series: Correspondence - personal (from C. H. Little to his mother); Correspondence - general (to C. H. Little); Orders for ministerial acts from the church book. 1898; Evangelical Lutheran Seminary of Canada and Waterloo College. Student financial records : 1931/32- 1933/34; Personal documents. Fonds acquired from the wife and family of C. H. Little on January 10, 1969. Additional material was acquired from Fred Little, son of C. H. Little, on Sept.13, 1974.